This product is now obsolete. The nearest replacements are the Drager PAS AirPack 2 and the Scott Safety Airline Breathing Apparatus. 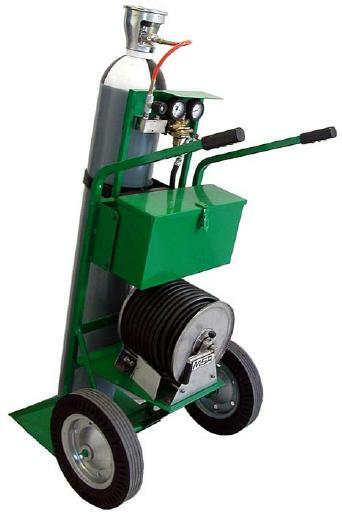 The MSA MASS trolley systems are an insulating and non-autonomous Personal Protective Equipment (as it depends on a hose supplying breathable air to the user) for respiratory protection, indipendent from the environmental atmosphere. Air for breath is supplied to the operator by cylinders of compressed air (whose capacity changes according to the model of chosen cylinders, so that many autonomies are admitted) through a pressure reducer, a supply line at medium pressure, a lung governed demand valve and finally a full-face mask complying with EN 136, class 3. The exhaled air is expelled through the mask exhalation valve directly into the environmental atmosphere. The hose for supply of breathable compressed air complies with basic requirements, as provided by EN 14593-1:2005 and it also meets antistatic requirements (S-marking) and heat resistance (H-marking). Hoses for compressed air are equipment used for breath in environments where there is gas or air, whose respirability is not guaranteed and are not suitable for the underwater use. 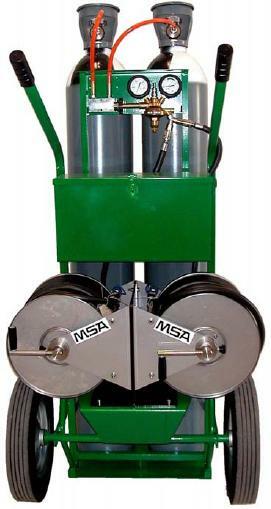 MASS trolley systems of MSA can be used in all places where the air in the environment following to the presence of harmful substances for human is no more considered to be breathable, as it can't be purified with absolute certainty or because the filtering equipment can't be any longer used because of lack of oxygen. The mobile systems for breathable air supply can be also used, when another equipment for the respiratory protection, like for example an self contained breathing apparatus or a filtering equipment can't be used because of a limited autonomy or unfavourable conditions of place of work that do not allow wearing a similar equipment or whose weight would worsen the usual conditions of use, by reducing its efficiency. In combination with suitable MSA Auer self contained breathing apparatus BD 96 Mini, BD Mini or BD 96 (in standard versions S, Z and S-Z), having the function of further air supply and by the use of a 3-way valve (ASV), the mobile Air-Line systems of MSA - MASS series - become an autonomous respirator. Protection of plants in case of an emergency, for example by allowing remaining inside a panel room in a heating plant for the setting at safety of plants with the possibility of using the self contained breathing apparatus to let in uncontaminated air again. Firemen for rescue interventions in contaminated environments, for example in tunnel, ships, wells, to the aid of people unable to move, by using them, if necessary, as air supply with anti-contamination overalls provided with a air supply hose.